With 500 miles of shoreline edging into clear, tranquil water, and distant views of Virginia's legendary Blue Ridge Mountains, Smith Mountain Lake is an idyllic backdrop for a cutting-edge, jaw-dropping estate. 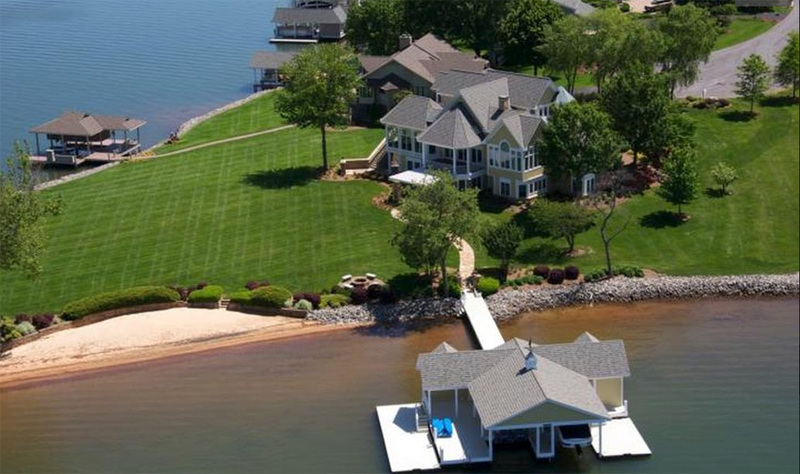 On Smith Mountain Lake, one house stands out. Unlike other 1980s-era McMansions, this developer-occupied estate exhibited quality craftsmanship, elegant architecture — not to mention panoramic views of one of the state’s most popular lakes. “My clients coveted it for years,” admits St. Louis-based designer Robert Idol. The couple was living in a condo on the lake nearby when a for-sale sign went up, and they didn’t waste any time making an offer on their dream home. While the home’s bones were in great shape, the detailing inside was “total Eighties,” Idol says, right down to the faux finish walls, dusty pastels and dark green carpet. With an abundance of windows at his disposal, Idol realized a laid-back California overlay would buttress the home’s airy predisposition, giving way to a design scheme that’s simultaneously simple and gorgeous. The kitchen didn’t need to be redesigned — it just needed some tweaking. The space only had one window, so Idol took it out and added three more to capitalize on the spectacular lake views. 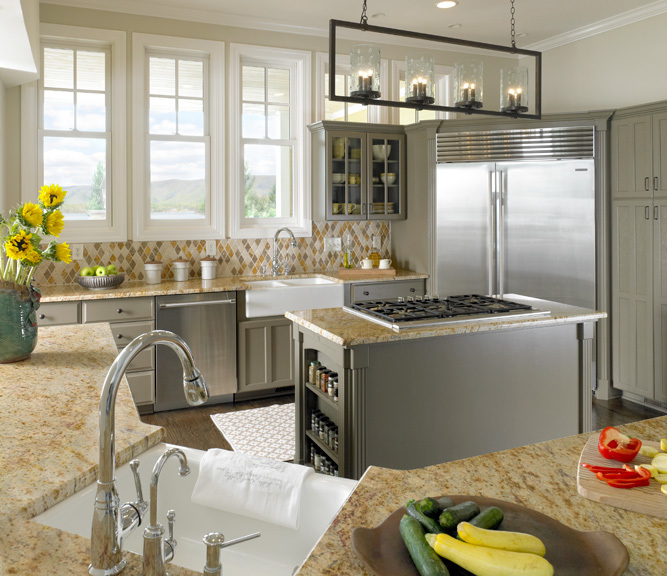 Next, Idol covered honey-colored wood cabinets in something modern (brown paint with a green patina) before adding an eye-catching backsplash that captures colors from new stainless-steel appliances and the home’s original gold-flecked granite countertops. The countertops dictated the main-level palette, and you’ll notice a gleam in throw pillows and pottery — even the Fibreworks natural basket weave rug in the living room has copper undertones. “The living room is one of those places where you just want to curl up all day,” Idol says, pointing to 42-inch deep sofas and oversized ottomans topped with custom-designed bone inlay trays. Striped end chairs from McGuire bookend a sleek white console, highlighting the room’s innate symmetry. The living room was supposed to be the dining room, but to correct issues with interior flow Idol swapped the two spaces. The homeowners didn’t need a big dining table as they’re more likely to entertain on the dock. So Idol opted for a round Italian table with an intaglio top for smaller, more formal gatherings. Idol reconfigured the home’s original firebox, next, adding bolection molding and continuing tongue and groove paneling before topping the hearth with an antique gate that adds texture, but also jives with the heirloom family portrait to its right. Unfussy upholstery does the trick on high-back dining chairs, which are one shade darker than an English arm lounge chair, and lighter than the Benjamin Moore “Wind’s Breath” walls. Subtle details such as these add visual interest without distracting from the view. In the bedroom Idol’s predilection for tone-on-tone design is even more pronounced. Inspired by that lovely floral headboard, a clean color palette (blue-gray with lots of creams) gets a punch of style from mohair fabric covering a bench and cushion on a Chippendale sofa, the latter a wedding gift from the homeowner’s mother. A metal drum coffee table has a “glint of metal,” Idol says, that brings the lake’s reflectivity into the room, remind the homeowners that the water’s never far.